is so popular. It has lots of great pics. Most people don't take the time to read beyond the captions. With that said, I still enjoy pretty pictures well made, especially as a filmmaker and that is what draws me to Catch Magazine. It's only online, its free, and if you haven't seen it you should check it out. It's filled with great pictures that get your juices flowing. And the videos mostly put together by Todd Moen but occasionally others are, in a word, excellent. The magazine is a really innovative concept, one that others are rushing to mimic. This is a long way of saying that you might check out their Catch Magazine Season 2 DVD . It is their second compilation of videos pulled from the publication. It is important to support online resources like this. They are almost all small, one or two person operations (ahem) and get paid more in satisfaction than dollars. 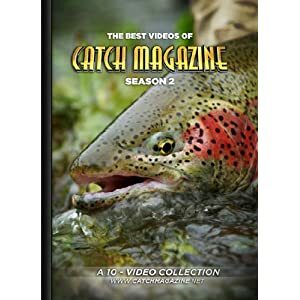 So if you are looking for a gift idea for a fellow angler, you might try one of their DVDs but at the very least you should take a look at the magazine. A long time ago I signed up to be an affiliate of Leland Outfitters in San Fran. I put an ad up and nobody clicked on it so I took it down. The other day I got an email about how they had a video ad so I took a look at it and thought it was pretty cool, at least from a filmmaking perspective. They also have a decent tying section on their site so you may want to check that out though I know most of you probably prefer to hand select if not hand make a lot of your materials. So below is the vid/ad. Enjoy. Click here for free same day shipping from Leland - FlyFishingOutfitters.com! So I thought I knew Facebook and I thought I would get a notification of everyone who shared that DVD link so I could give away a DVD.....But I couldn't. Whoops. So instead, with a red face, I'm going to try to rectify that mistake. If you shared the link, or even if you didn't really, please leave a short comment on this post. The captcha thing can be a bit of a hassle sometimes but hang in there and send me an email if you just can't get it. I'll give away 5 (five) TWF DVDs (or downloads) to individuals. They can pick which one they want from the TWF DVDs. As always, thanks for your patience. I've been in Churchill for going on three weeks now and I've seen some incredible stuff and met some truly interesting people. Here's a couple of pieces I've done if you are interested. The first is "Clash of the Polar Titans" which features some almost over-the-top music and polar bears sparring in the snow. Younger bears spar while they wait for the ice to come in just for something to do and to practice for when there's actually something to compete for. They have almost nothing to eat until they can get out on the ice. And here's a somewhat less exciting compilation of three timelapses I did including one of the Aurora/Northern Lights. TimeLapse: Two sunsets and an Aurora from Henry Harrison on Vimeo. Polar Bears International just published the first video of this year's field season. I actually made this video last year. Its about how polar bears den and how they study them. There are clips of cubs and sows outside their snow dens as well ad full grown bears in Churchill(footage by John Shier of 45 Degrees North Films).